I fell in love with Lana Del Rey a week after I got my driver’s license. Sixteen and in the deeper throes of teenage angst, I’d taken to calling the suburban split-level I’d grown up in “my parents’ house” and spending as much time as possible out with my steady, if less than stable, high school boyfriend. Eager to assert my right to independence—which I loosely defined as freedom from all responsibility— I saw my license as a golden ticket to some idyllic limbo between childhood and adulthood, a world constrained neither by curfews nor early-morning commutes. This was the world of teen TV dramas, of Skins and 90210, a place where dysfunctional families and dysfunctional boyfriends could be drowned nightly by mixed drinks and dance music. It was the world I sought to create when I would shoot vodka from water bottles in the local park where elderly couples walked their dogs and watched sunsets. And this was the world that Lana Del Rey seemed to promise as she crooned about diamonds and motorcycles over violins that could have come from my grandmother’s record collection. Lana Del Rey was the soundtrack to my newfound freedom. Driving home past midnight down empty highways, I listened to Born to Die and Paradise on repeat, imagining myself a part of the dizzy and shimmering American landscape she created. In its lawlessness, its toxic thrills, I found the perfect escape from the dull regularity of high school. Yet whenever anyone called Lana a pop artist, I flinched. Though she presented the same illusions of indulgence and liberty that Top-40s artists have been selling for decades, her music felt authentic in a way that the bubblegum love songs of Katy Perry and Taylor Swift did not. Lana’s pop wasn’t celebratory. It was sad. The glittering anarchy of her world was as full of sorrow as it was of pleasure, and as gritty as it was glamorous. And Lana’s angst made her music feel real. It gave the texture of rawness and authenticity to a world that I could only dream of. Though the dive bars and bikers she sang about came from a place I could only imagine, the sorrow in her voice—the teenage heartbreak, the loss of innocence—was all too familiar. And if her pain could be mine, it felt like her freedom could be mine, too. Yet there was another dimension, I think, to my attraction to Lana. She was the epitome of the girl who had everything, who had nothing; the beautiful, prep-schooled white girl whose looks, money and success couldn’t silence the demons in her own mind. Listening to “Diet Mtn Dew” in my own cul-de-sac bedroom, I got an odd sense of comfort from her shameless declarations of insanity, her senseless rejection of the comfort she was born into for the danger she felt she deserved. And Lana wore her melancholy with pride. She didn’t feel a sense of shame or guilt about feeling empty amidst the spoils of privilege, about singing about self-loathing in mascara and lipstick. She made it ok, even beautiful, to feel crazy. It wasn’t until my freshman year at Princeton that I began to question just how empowering Lana’s message really was. At the time, I was enrolled in a GSS course exploring feminism in the media, and we were discussing the widespread elision of female suffering with beauty. With this on my mind, I began to feel there was something troubling in the way that Lana seemed to accept, even to embrace, her own self-proclaimed pathology. I had always interpreted Lana’s melancholy style as honesty. Her sadness, I thought, gave a flavor of authenticity to otherwise cliché images of glamour and liberty. Only now did it strike me that these images might also glamourize her sadness, and I wondered which message was coming across to her other teenaged listeners. Because as affirming as it can feel, at sixteen, to know a pop star shares your vulnerabilities, Lana’s music walks a fine line between validating female pain and glorifying it. As one might anticipate, the trend met with a great deal of backlash from critics who accused artists and advertisers of selling mental illness as glamour. Yet the harshest fire came not from anti-drug crusaders, but from feminists, who took issue with the frail, doe-eyed “waifs” being set forth as an ideal of female beauty. Malnourished, pouting, and dressed in rags, these women evoked an image of childlike dependency. Too “sick” to care for themselves, they seemed to beg for the stable guidance of a man. To say that Lana is glorifying this juvenile dependency, however, would be a gross oversimplification. Like the sickly pallor of heroin-chic models, Lana’s need for her men is pathological, and we, as consumers, are meant to know that. 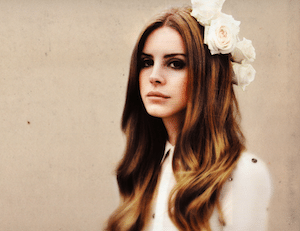 When she sings, in “Ultraviolence,” “you hit me and it felt like a kiss,” her voice carries both affection and pain. We are meant to understand that this is not a model for a healthy relationship; that Lana is trapped by her own complicated emotions into accepting a situation as full of suffering as of passion. Yet though we are not meant to approve of her predicament, we are, I think, to sympathize with the emotional instability that gave rise to it. Heroin chic was so problematic because, though models’ dull eyes and emaciated bodies were unsettling, they were nevertheless beautiful. Likewise, Lana’s childish diction, her compulsive need for the attention of older men, emerge as acceptable, even enticing, qualities in an attractive woman. It is easy for me to excuse my sixteen-year old obsession with Lana by claiming that I simply didn’t see these sexist undertones. Yet I still listen to her, even as I disagree with so much of what she seems to represent. Though the feminist part of me flinches at her likening of a man’s fist to a “kiss,” I am still just as captivated as I was at sixteen by the melancholy vibrato in her voice, and I still feel chills from the trite poetry of her lyrics. And I am certain that my obsession with Lana is more than aesthetic appreciation. Because, on some level, I think that precisely what is most anti-feminist about Lana is also what makes her so enchanting, particularly to young people. By declaring herself helplessly reliant on men, she is allowed to surrender all of the responsibility that comes with adulthood while holding onto its R-rated thrills. Like a child, her dependence allows her the freedom from the stress and monotony of grown-up life. Yet the bikers and sugar daddies she croons about are anything but overprotective parents. She is living the fantasy I dreamed about at sixteen, free both from curfews and from the 9 to 5. Of course, this arrangement comes at a price, as her wounded vocals and melancholy lyrics make clear. But even Lana’s pain is made palatable, the heartbroken ballad of a starlet with the lips of a Vogue cover girl. Sometimes I’ll register a line that seems particularly superficial or degrading and scold myself for enjoying music that is so at odds with what I believe. Yet it is in these moments that I realize that, while Lana’s world is attractive, it is so only as a fantasy. Just as the countercultural appeal of heroin chic loses its appeal in the face of the harsh realities of addiction, Lana’s freedom through subservience ceases to glimmer as soon as you consider its practical consequences. Yet, somehow, this doesn’t make the fantasy any less enticing. And maybe this is what pop music is for: to allow us to revel in our shameful, sinful, even politically incorrect desires, while keeping them safely outside of reality.